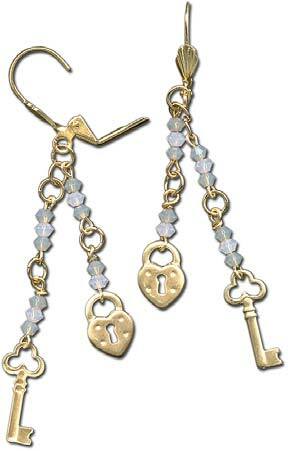 Make and wear these stylish beaded earrings to a romantic meal or Valentine's Day celebration. These beaded earrings from Rings & Things also make for a quick Valentine's Day gift. Bead 6 eye pins in the following pattern: 1 gray crystal, 1 rose water opal crystal and another gray crystal. Bead 2 eye pins with 1 rose water opal crystal and 1 light gray opal crystal. Then, using round-nosed pliers, make a wrapped loop at the top of each pin. Open the basic loop on a 3-crystal pin and attach a key charm. Use a jump ring to attach the top loop to another 3-link crystal pin. From the top of this pin, attach 3 jump rings into a chain, leaving the last jump ring open. TIP: When you open and close jump rings, twist sideways (as shown below). This keeps their shape better, which makes them easier to close all the way.